Inspirations work & it could have been no better than this when a group of women came out as a unit to work together after having been inspired by one of their own. It was a Godak Yarin, a farmer from Yada village in Lower Subansiri District of Arunachal Pradesh who represented North East India in the Small Holders Farmers’ Conference (SHFC) held at New Delhi from 10 to 12 March 2015. After her return to village, she shared her experience to her people. “I was happy to be part of the conference where I met farmers from other parts of India as well as abroad”, said Godak. But she was equally disappointed when she looked back at her village where people are somewhat reluctant to work hard. Godak was determined to change this picture come what may! All that she dreamed of is waking up to a new horizon of change in her village exclaimed Godak. She invited mostly women to her house & sat with them discussing in length about things that could benefit them. It all started happening from here. Though men did not take much interest, women seemed to be moving in the right direction. “For the first time we felt that we can also do something productive”, said Ms. Maya Yayum, a woman farmer from Yada, Godak’s village. The news spread fast in Yada village & more women rallied behind Godak. “We were happily surprised to understand what Godak tried to convey from her experiences & now it was for us to play active role”, said Ms. Kabak Pacha. 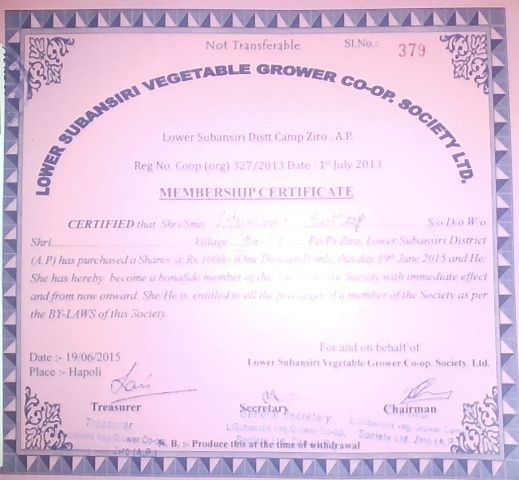 Altogether 28 women farmers joined hands & were rearing to go & do something beneficial for themselves & the society. They decide that they would form three separate Self Help Groups (SHGs) that would work together in agriculture & other income generating areas. For our partner Itanagar Diocesan Development Association (IDEA) it was nothing less than a shocker when they were witness to kind of unexpected mobilization by the people themselves. “Once Godak returned from Delhi, we told her to spread the message among people but we never expected this kind of a response,” said Taw Bosco, member, Team IDEA. 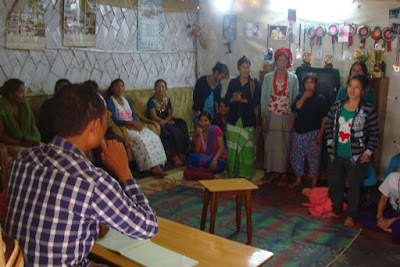 Team IDEA took over from here & facilitated meetings of the women with the concerned Government officials in the area. It was decide that the 28 women would be divided into three groups & they would work on the same lines towards raising their incomes. The group had an audience with the Block Development Officer (BDO) & District Agriculture Officer. The groups expressed the desire to be registered as three separate SHGs in the area. “We explained to the Officers about our intentions of working as a group for agriculture & other income generating activities”, said Ms. Godak Tickap. Later both the officer made a personal visit to the agricultural fields of the groups & lauded them profusely. The Officers assured them of all of kinds of cooperation towards forming their respective SHGs. The BDO then referred the farmers to the Cooperative Officer. The Cooperative Officer after giving them a patient hearing wasted no time & gave away membership certificates to 28 women farmers during June 2015. “We felt so nice to be awarded with the membership certificates, we have also opened our individual bank accounts by depositing Rs 1000.00 as per the instructions of the Cooperative Officer”, said Ms. Godak Chaluk. Godak, the torch bearer was nothing less than being the happiest to see the developments. She continues her efforts to motivate & mobilize people to do something constructive. “Mei akela hi chala tha Janib e Manzil, Magar Log Milte Gaye Aur Karwan Banta Gaya” (I was walking alone towards the destination but people started joining me & adding up to the caravan). These lines by poet Majrooh Sultanpuri are a tribute to a Lady who inspired people.